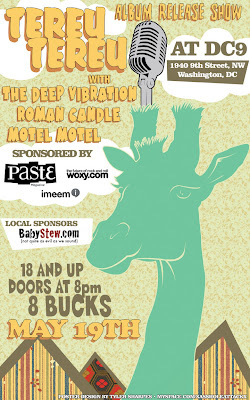 Kudos to Steve at BabyStew.com for helping organize an excellent lineup at DC9 on Tuesday, May 19th: Tereu Tereu with The Deep Vibration, Roman Candle AND Motel Motel. It's not often you get to see four terrific bands for 8 dollars. There's really no excuse for missing this show. And be sure to get there early for Motel Motel. I can't get enough of their Old York EP, especially "Coffee".